Many sites that have successfully implemented certified EHRs have evaluated or potentially integrated a medical imaging portal to view images and comply with the image access measures in Stage 2 of Meaningful Use (MU) standards. This exercise likely included tackling a major “ology” obstacle – how different departments like radiology, cardiology, oncology, etc. store, retrieve and share information. At most hospitals today, each “ology” owns their own domain and silos of information with no cohesion and little sharing of information across departments. Not only did each department find their own independent storage and viewing solution based on their immediate needs, but departments also routinely competed with each other for precious dollars to expand their domains and many times, cooperation between departments was non-existent. These turf wars must come to end and a common backend and synergistic viewing platform must be built to adapt to the shifts occurring in our healthcare system today, meet the demands of MU standards, and improve patient care. 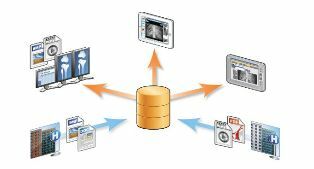 Implementing a Vendor Neutral Archive (VNA) for storage across “ologies” – Consolidating disparate imaging systems from different departments into one repository using interoperability standards is a critical step to building a unified back-end that allows multiple domains to remain independent. A single archive drives costs down, fosters continuity within an organization and can help clinical users get a unified view of patient clinical information across disparate systems. Finding a viewer or portal to handle all image types for display and access – Stage 2 MU standards set a threshold of 10 percent or more of imaging results accessible through certified EHR technology. However, the standards clarified that images do not have to be stored in the EHR, but there must be a link to where the image and information can be accessed. To comply, many providers will enable image access and sharing by pairing their VNA with a zero-footprint viewer that can be embedded in an EMR system to provide access to reports and images alongside the patient’s other medical information. Moreover, the viewer must provide access to DICOM, as well as non-DICOM image related data, such as JPEG images and PDF documents. The viewer’s use must not be restricted to a single department system or facility, but offer extensive compatibility to provide secure access to images across and beyond the enterprise. Determining an approach to assignment to patient longitudinal record – Even though VNAs solve storage problems, they don’t resolve the different workflows that exist across different departments. And sure, multiple integrated viewers can give you secure access to images from a variety of departments, but how does a caregiver view and compare multiple images across various “ologies” without a common means to tie to images to a single patient? Consider this: radiology has long used accession numbers, generated by orders input into a RIS, to deal with identification of images once acquired and stored digitally. Some organizations may require ancillary imaging departments to use the facility’s RIS system to generate an accession number so all images stored in a VNA have a standard numbering schema. Other imaging modalities like cardiology or ophthalmology don’t use accession numbers and may not even require an order to acquire or store the image. Neither approach offers a viable solution because requiring an accession number could disrupt departmental workflow, and without an accession number or standardized numbering schema it is cumbersome to view a patient’s longitudinal imaging record and compare cross-department images. One mechanism that can help bridge the gap between associating images to the correct patient and the workflow within individual departments is simply changing the method for retrieving those images. Typically, providers will work off a worklist when selecting an exam or launch it directly from within the EHR based on the integration capabilities available today. However, changing how data is retrieved via search tools could be one method to solve this problem in the short term. Most search algorithms in today’s software are based on a structured search. Data is stored in a relational database in a highly organized fashion with a specified data model. For example, searching by a patient’s last name, accession number and birthdate. All three data elements are exact and located in a specified area of a database. Using an unstructured search model may bridge the gap to finding different studies across various “ologies” while allowing the independent imaging departments to continue with their existing workflow. Unstructured searches query for information that is not well defined or organized and does not have a precise data model. It can leverage “look ahead” capabilities, “term weighting” or semantic expansion (applying similar meaning words to the text being “searched”) to assist with patient association and retrieval. You can be assured that as the field continues to evolve in our sophistication of patient healthcare access and sharing, new tools will become readily available to assist caregivers in their ability to see everything they need in a patient’s longitudinal record that is relevant to their current condition being treated. Eliminating departmental silos of information should be an urgent goal for healthcare providers – of which storage and viewing plays a large role. But your image-enabled enterprise is not complete until you address assignment to and retrieval of the patient longitudinal record across “ologies” to deliver a cohesive, patient-centric view of medical data that allows caregivers to make better and more informed care plans. How does your organization plan to address image access and sharing across departments?